A view from the “Kinetic Field” main stage at the Electric Daisy Carnival (EDC) at the Las Vegas Motor Speedway. 3G Productions, the sound reinforcement provider for three of the show’s stages, deployed the Focusrite RedNet D16 AES, creating a secure connection between the FOH position and the over-100 amplifiers used to power the system. 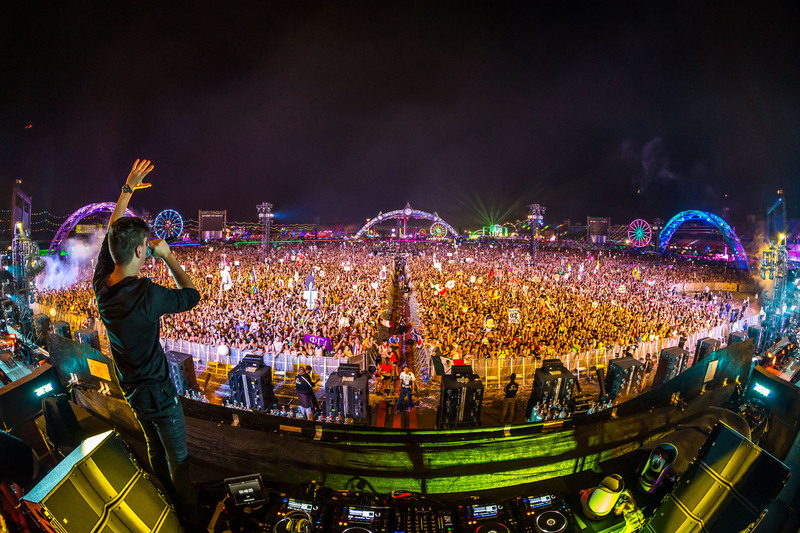 Los Angeles, CA, November 23, 2015 – Electric Daisy Carnival (EDC), a major festival of the electronic dance music world, took place earlier this year at the Las Vegas Motor Speedway. The fifth edition of the festival, which drew over 400,000 attendees, also marked the debut of the Focusrite RedNet D16 AES interface at the event, where 3G Productions, the sound reinforcement provider for three of the show’s stages, deployed the D16 AES for the output of 96-kHz audio via Dante™ networking to AES3-compatible amplifiers in the d&b audiotechnik J System P.A. with D80 amplifiers on the main “Kinetic Field” stage. As artists including Tiesto, Calvin Harris, Armin Van Buuren, Avicii, Kaskade and Afrojack performed in front of thousands of fans, RedNet D16 AES created a secure connection between the FOH position and the over-100 amplifiers used to power the system. The RedNet D16 AES is a 1U 19-in rack-mount interface featuring 16 channels of AES/EBU connectivity to and from a Dante audio network, with Ethernet redundancy for maximum network reliability. Perfect for bridging between digital consoles, power amplifiers or any other AES3 equipped audio equipment and a Dante network, RedNet D16 AES has a Sample Rate Convertor (SRC) on each input pair allowing instant operation with any AES3 source. Word Clock and Digital Audio Reference Signal (DARS) connections provide synchronization with a wide range of hardware, while S/PDIF I/O allows the integration of equipment such as CD or solid-state recorders/players. Photo caption: A view from the “Kinetic Field” main stage at the Electric Daisy Carnival (EDC) at the Las Vegas Motor Speedway. 3G Productions, the sound reinforcement provider for three of the show’s stages, deployed the Focusrite RedNet D16 AES, creating a secure connection between the FOH position and the over-100 amplifiers used to power the system.